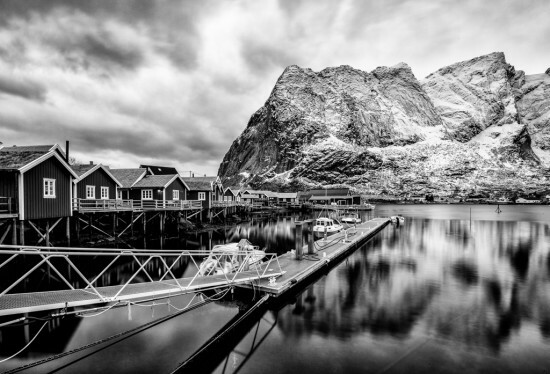 When I visited Reine and Svolvær in Norway’s Lofoten Islands back in 2013, I knew that the three days I had allotted weren’t anywhere near enough to do the place justice. I wasn’t sure when I’d ever get back — given the remoteness of Norway in relation to my home base of Australia — but I hoped I’d get the chance someday, preferably with a rental car so I could explore much more of the islands than I could ever see by bus. As you know from my announcement last year followed by my account of the worst drive of my life, I made it back to Lofoten a lot sooner than I might have expected. 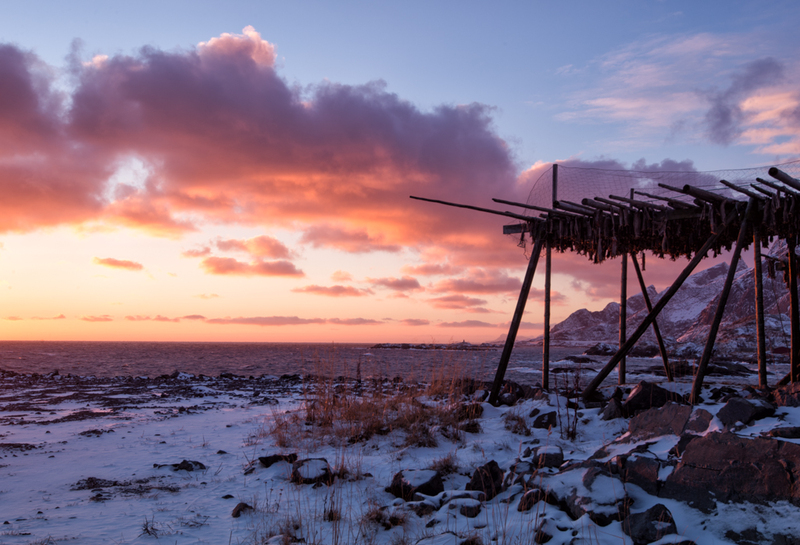 Given I was going to be in the (very general) area for a travel fair in Helsinki, I suggested to my friend Ben Ashmole that we go on a photography weekend in the Arctic. My selling point: the fact that the islands would have just come out of polar night and would have a grand total of 2.5hrs of sunlight per day. And this is what you get in those 2.5 hrs of sunlight. To a normal person, this may not seem like a selling point. Why wouldn’t you wait until later in the year when there was more sunlight? There are two answers to that question: (1) I couldn’t go later in the year because flights to Europe from Australia don’t come cheap. (2) We’re photographers. We’re not exactly normal. 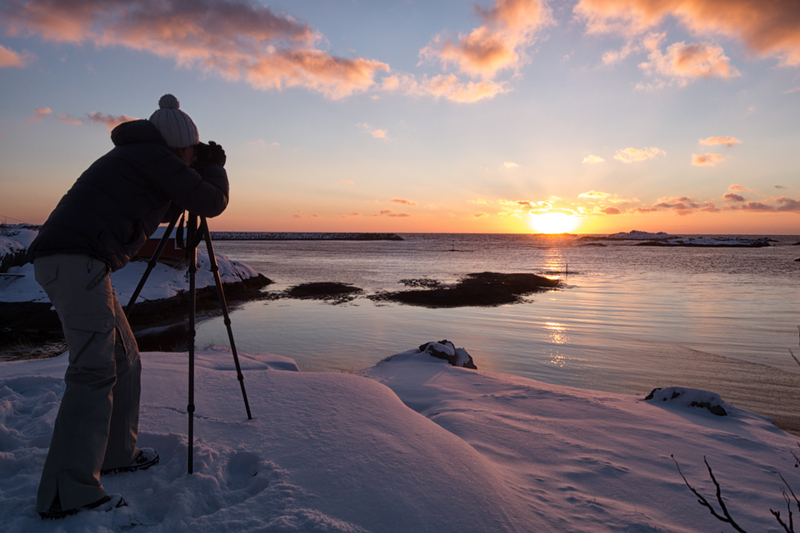 So as photographers, what did 2.5hrs of sunlight mean to us? Well, it meant that we’d have one continuous sunrise/sunset. The sun would peek over the horizon, stay just high enough to turn the sky every colour of gold, orange, and pink that you could imagine, and then it would disappear again. For two hours either side of this, we would have what is called “blue hour” — twilight that turns the whole landscape blue. 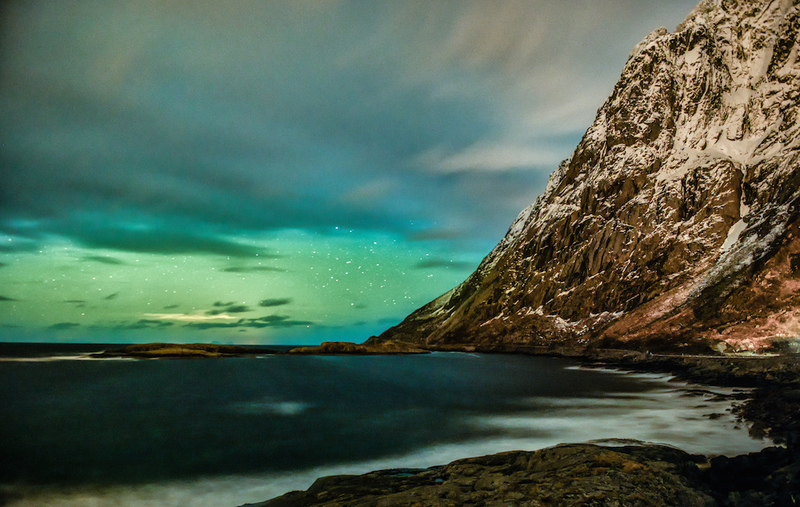 Then, if we were lucky, we’d get to watch the northern lights dance over the fjords all night. Sounds great, right? But did it actually happen? The photos below will tell you that story. We saw perfect reflections that were jaw-dropping even in the dark. Our drive into the islands started well after darkness had fallen. After landing at Harstad-Narvik Evenes Airport (because one place name wasn’t enough for the airport), we hopped in our rental car and began the 2.5hr drive to Kabelvåg. Once we’d made it through the snowstorm we’d landed in, the landscape became completely still and silent. We got out a few times just to gawk at the massive mountains surrounding us, and at the spot pictured above, we knew we had to get out and snap a few photos because we could see how perfect the reflections were even in the dark of night. Good thing we did, because nothing was this calm for the rest of our trip. 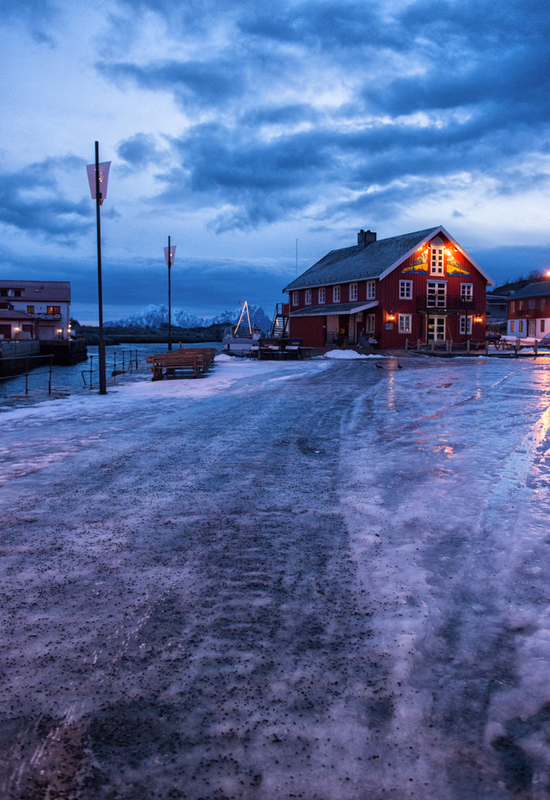 Early morning in Kabelvåg. Early morning being about 9.30am. 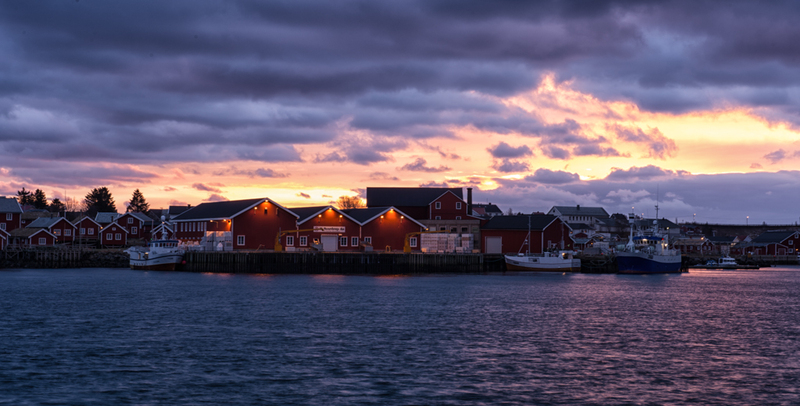 The lights of Kabelvåg still on as twilight begins. 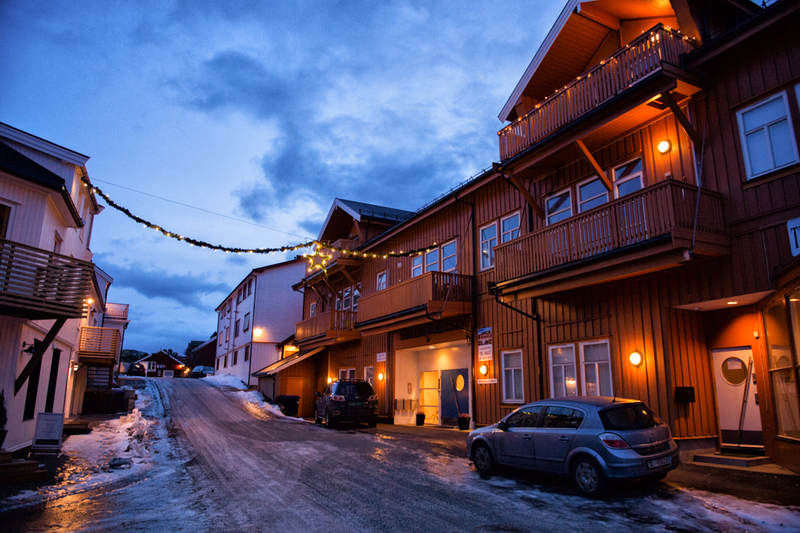 Unfortunately we didn’t get much time in the village of Kabelvåg, but we at least got to see its streets, draped in fairy lights to help brighten up the darkness of winter, in the blue light of early morning. Here, early morning meant 9.30am. Our body clocks changed so quickly it was ridiculous. 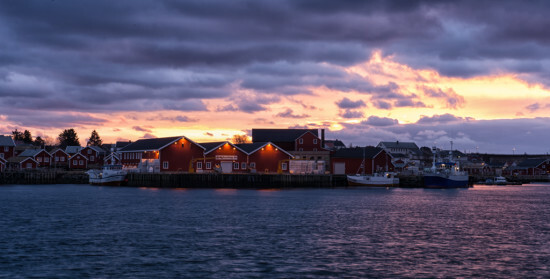 The fishing village of Henningsvær just before sunrise. The sun rises over the rocks and empty stockfish racks of Henningsvær. 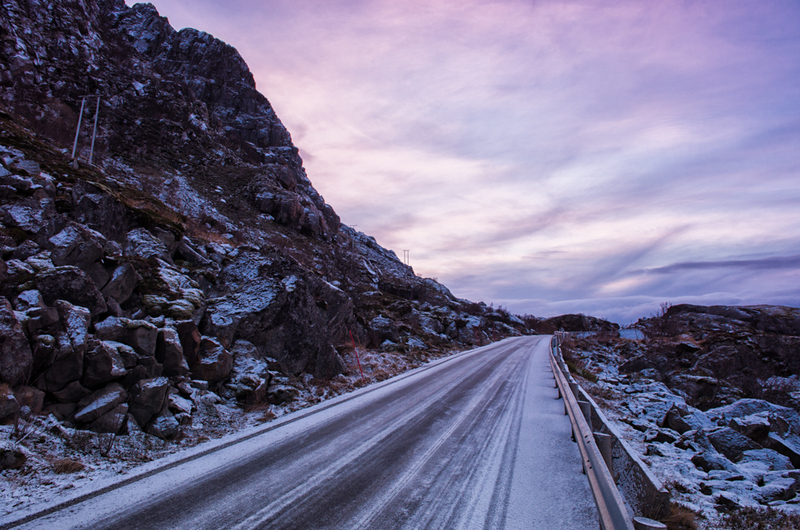 The road into Henningsvær being lit up by the pinks of an Arctic dawn. 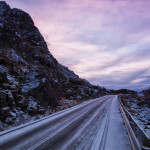 The road from Henningsvær back to the E10, the main highway in Lofoten. 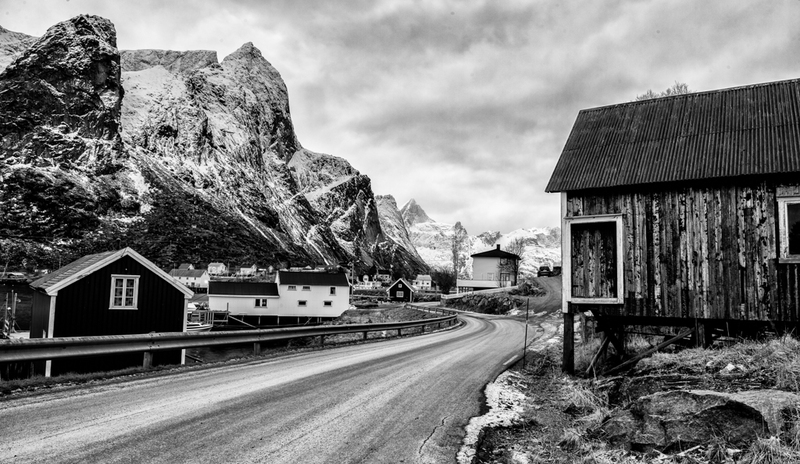 We took a short detour to the small fishing village of Henningsvær on our way south. 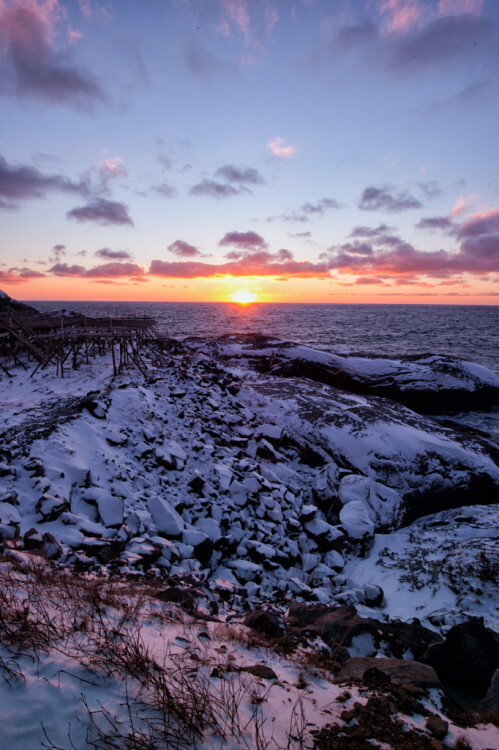 The sun rose — barely peeking over the horizon and often not visible over the rocky outcrops that sit just offshore there — but it wasn’t quite strong enough to make the northern sky light up yet. The sun sets over a rocky beach on the E10. Sunset was still going as we pulled up near a rocky beach between Henningsvær and Leknes. Cars passing by as I take photos on the side of the road. The sun had finally set by this point. It also ended up being our last photo stop otherwise we were never going to make it to the Airbnb accommodation — owned by Rolf-Helge the amazing Norwegian fisherman — that we’d booked for the night. Hunting for the northern lights near Reine. Colour over the red buildings of Reine around 10am on our second day in the islands. Despite the reasonably heavy cloud cover, we had the promise of colour when we arrived in Reine for sunrise on our second day. Unfortunately, it didn’t last for long, and we were left with clouds threatening heavy snow — snow that arrived that afternoon and stuck around all night. On the road in Reine. Olstind Mountain standing against the heavy cloud cover behind. Ben standing above Reine trying to capture the last of the fleeting colour in the sky. 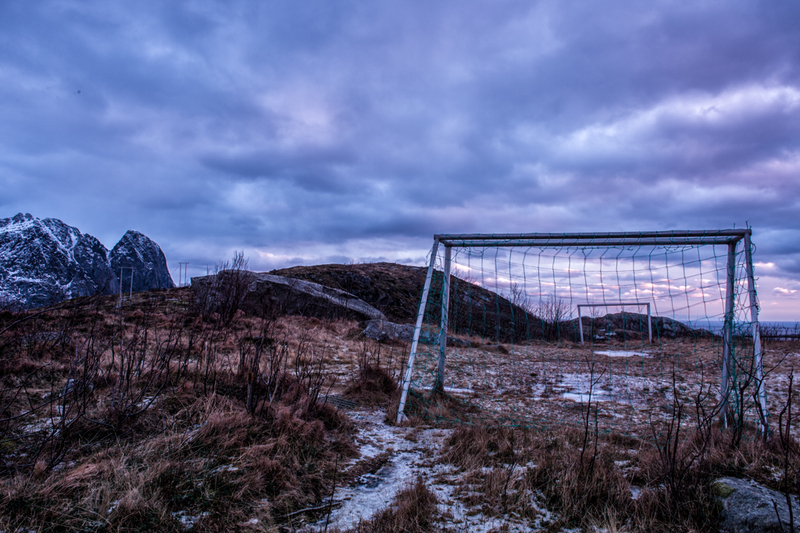 Anyone up for a game of soccer here? Now doesn’t that look inviting? Given how cold and blustery it was, I think the last thing on my mind was playing soccer. Looking to the west from the small harbour at Reine. Still, my favourite images from the day were definitely my black and white shots. I was happy to at least get a few photos I was happy with even though I only shot about 60 total for the entire day. 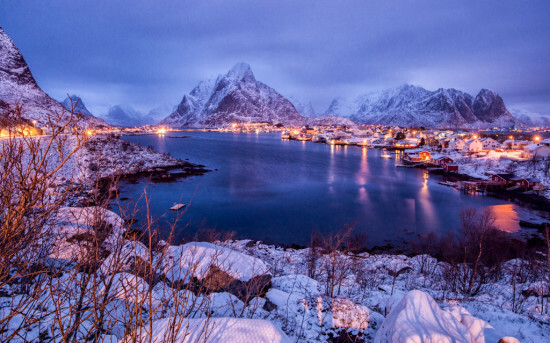 Blue hour in Reine after a fresh dusting of snow the night before. Looking towards the E10 from the lookout in Reine about 1.5hrs before sunrise. The fact that we were stopped from going out looking for the northern lights didn’t really matter when we woke up the next morning to a world covered in a blanket of snow. Rather than looking desolate and forlorn as it had the day before, everything suddenly became a winter wonderland. 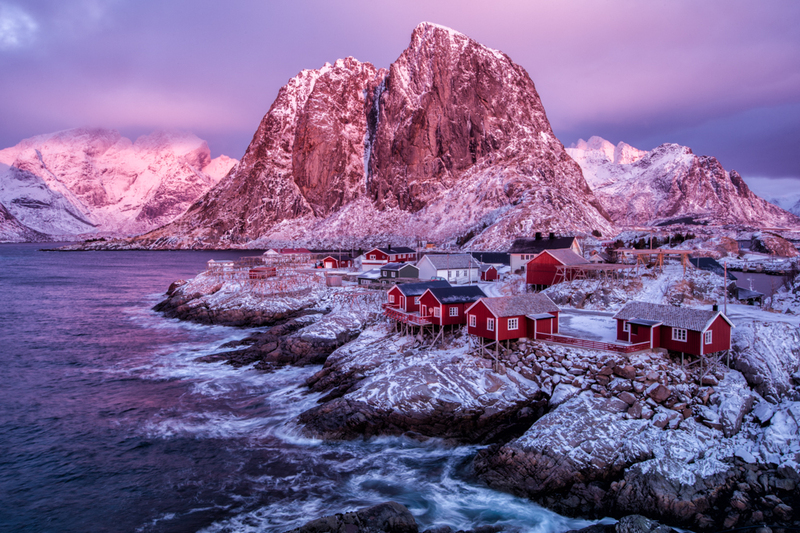 After a bit of debate, we decided to go back to Reine rather than go to a new location, since we really wanted to capture the village, arguably one of the most beautiful in the world, with some sunrise colours lighting it up. Standing above Reine Rorbuer with the walls of the fjord rising beyond. What a spot. Colours beginning to light up the sky to the south. 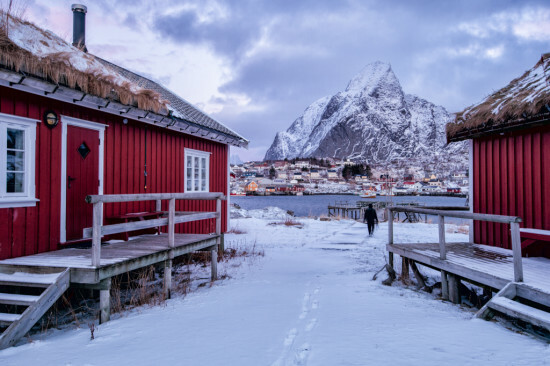 Ben walking through the fresh snow between two of the cabins of Reine Rorbuer. The cabin to the right is the one I stayed in two years prior. We were already pretty happy with the day — and had captured more photos we were happy with — before the sun even came up. 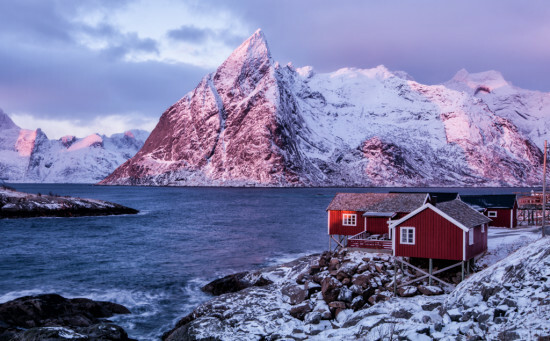 We had a good wander through Reine Rorbuer, the fisherman’s cabins where I had stayed on my previous visit, but when pink began to appear in the sky, we hopped in the car and headed to our planned sunrise spot. Wow. 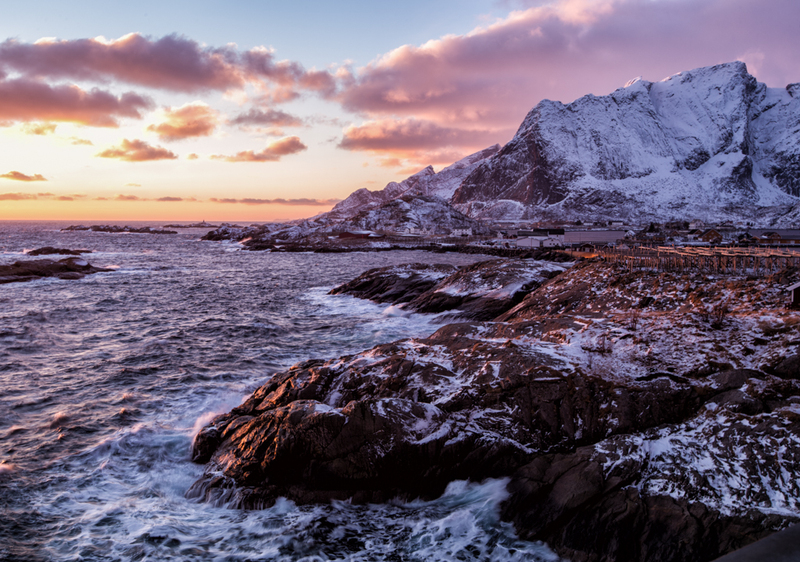 This was one of two shots I had aimed to capture while in Lofoten, but I had no idea I’d be able to capture it at a time when the whole world had seemed to turn into cotton candy. 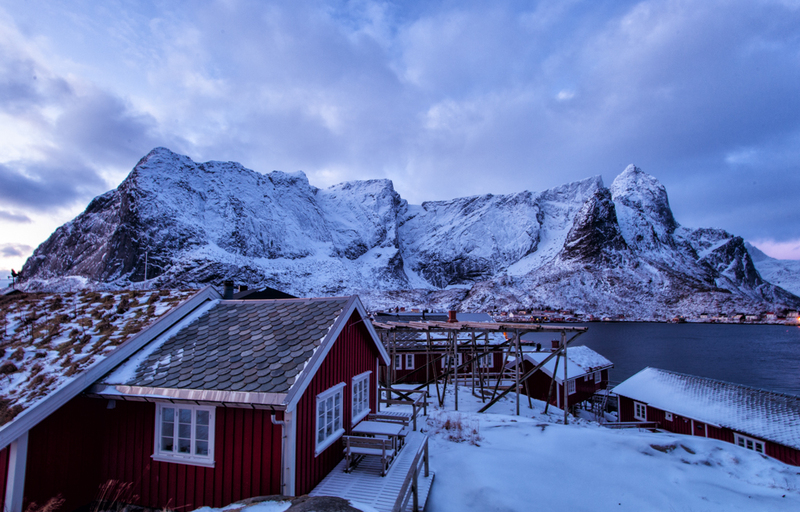 We rushed around on the bridge that overlooks Eliassen Rorbuer (the red cabins in this photo) trying to capture every angle possible while the light was this good…only to realise after 30 minutes that it just wasn’t going away. The mountains stayed roughly the same shade of pink for the entire hour we were there. It was insane. Looking south from the Hamnøya bridge. 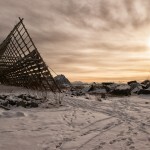 One of the many stockfish racks of Lofoten with the sun on the horizon behind. 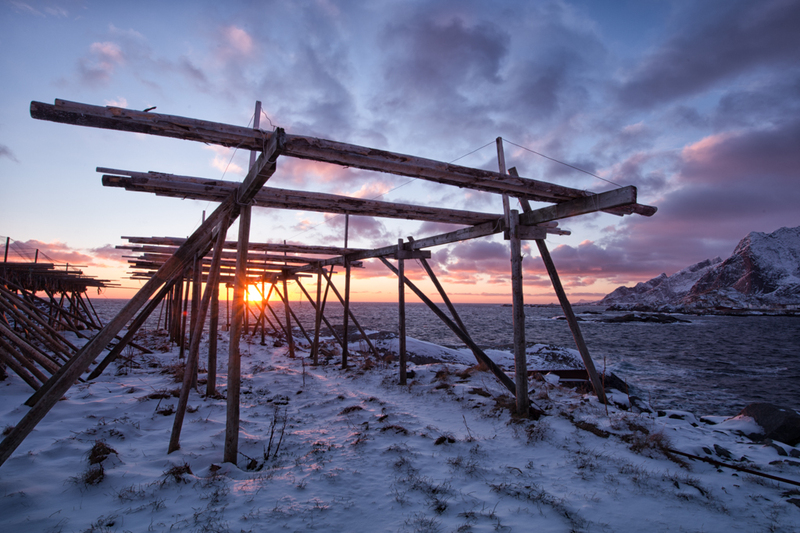 Sunrise over the only full stockfish rack we saw in Lofoten. 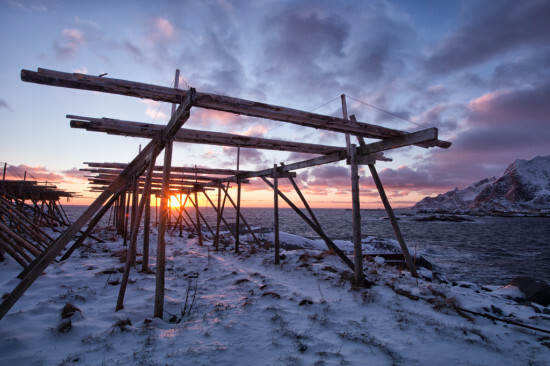 The last two shots are from the stockfish racks that were on the opposite side of the road to Eliassen Rorbuer. The second rack is the only one I saw in Lofoten that actually had fish on it already. By March, most of these racks would be absolutely chock full of codfish, which would slowly dry out by spring, at which point it would be shipped to places like Portugal, who call it bacalão and treat it as a delicacy. Another shot aiming south. Notice how the sun hasn’t gotten any higher off the horizon yet at least 30 minutes must have passed. 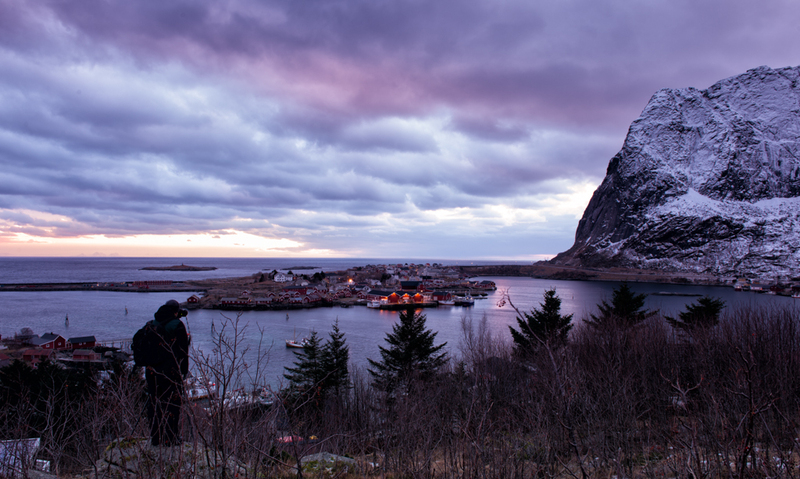 Looking towards the village of Reine from the Hamnøya Bridge. Eventually, we’d captured almost every angle we could — although I think both of us would have happily run around for another hour looking for as many different shots as possible. 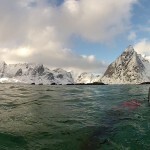 Instead, we decided to go further along the E10 towards the end of the islands (which was only about 10km away) so we could see a bit more than just Reine. A cabin on the edge of the world at Sørvågen. We eventually came upon Sørvågen, which had the perfect mix of rocky outcrops, untouched snow, and cabins looking out on the sunset. 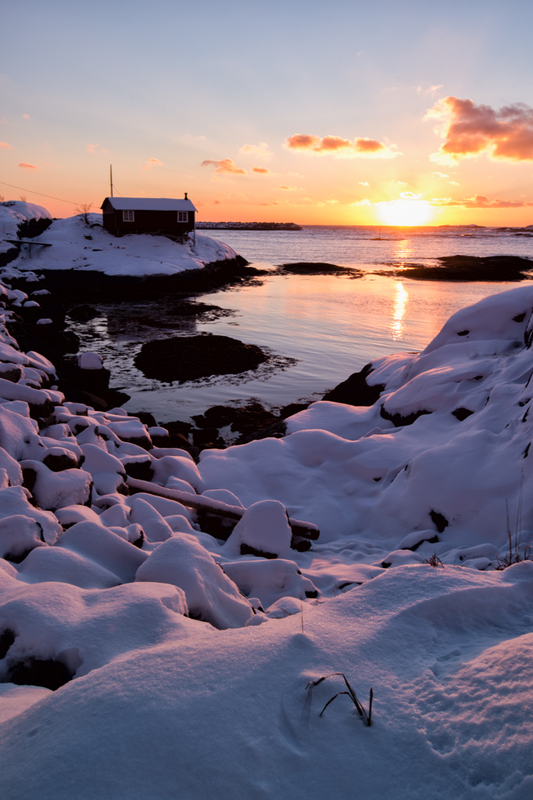 It was there that we saw the sun for the last time in Lofoten, given that a winter storm was bearing down on us and would be in full force by the next morning. The snowy E10 at Sørvågen. Pinks and oranges as the sun sets on a perfect day of photography. In my full Arctic gear setting up my final shots of the day. Given how perfect the day had been, we had high hopes for clear skies and possible aurora watching that night. Unfortunately, by 6.30pm, when I first caught a glimpse of green in the sky, the clouds that would hinder our driving the next day were already moving in. We went out to our planned spot, but the gale force winds blew Ben’s tripod over and made for a not particularly pleasant environment. After a few photos, the sky was completely blocked by clouds. At least we gave it a try though. 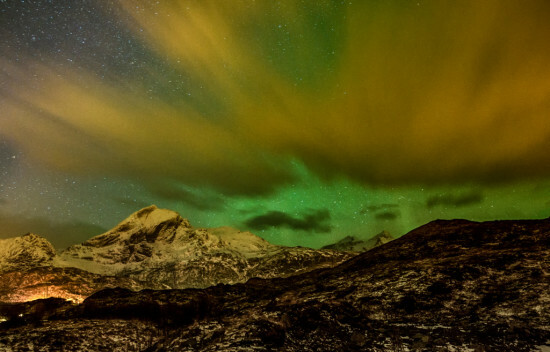 The northern lights hiding behind a cloud. One beam can be seen to the right of the image. I think the photos say a lot more about the success of our trip than I can say in words. Sure, the weather didn’t play nice and stopped us from shooting some of the locations we’d hoped. 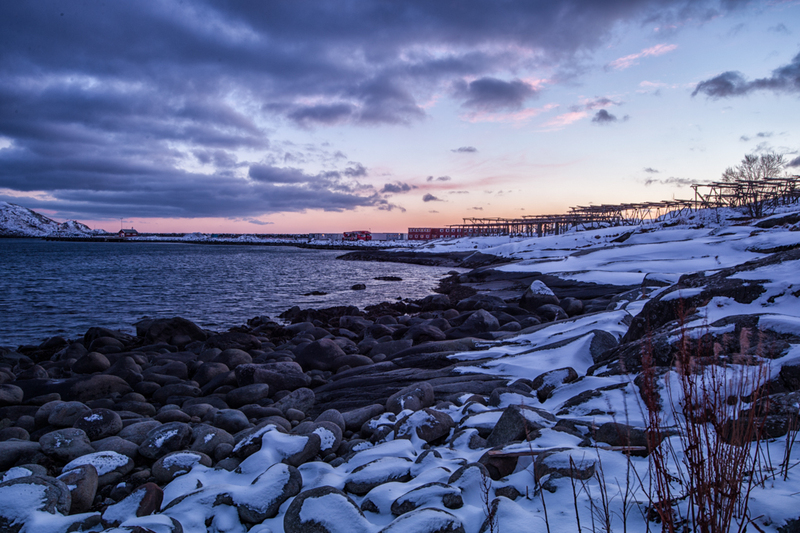 That said, if we expected to get perfect weather in the Arctic Circle in January, we would have been delusional. We made the most of our trip and Ben and his fiancé Laura both left saying that the Lofoten Islands were the most spectacular place they’d ever seen — a refrain I myself had uttered two years prior and could only agree with more after this trip. 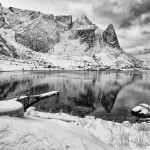 I love these photos and I love Lofoten! It’s couple of years since my last visit, really want to go back! Thanks very much Satu! I totally understand wanting to go back — it’s one of those places that is just so magical that it draws you back again and again. I’ll be visiting in July to get the summer experience 🙂 I hope you get to go back soon as well! Beautiful country! I love photographing up north–it’s challenging, but an extraordinary landscape and great light. It really is a stunning country. And I agree — up in the north it can be very challenging, especially since the weather is very changeable (as I’ve found on my current trip)! No matter what time of year it is, though, the light is amazing and so different to what you’ll find anywhere else in the world. I think that’s why I keep coming back year after year! Thanks so much Sabine! I hope you do get to go back in winter — it’s such a magical place then. I would happily go back again and again if it wasn’t so difficult to get to from Australia! 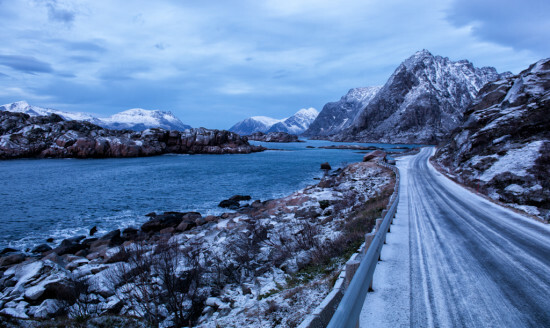 is it safe to drive in lofoten islands during your winter trip? could you comment your drive around lofoten islands? thanks. Hi Laiteck, apologies for the delayed reply. It is safe to drive in Lofoten in winter if you are able to drive for the conditions. 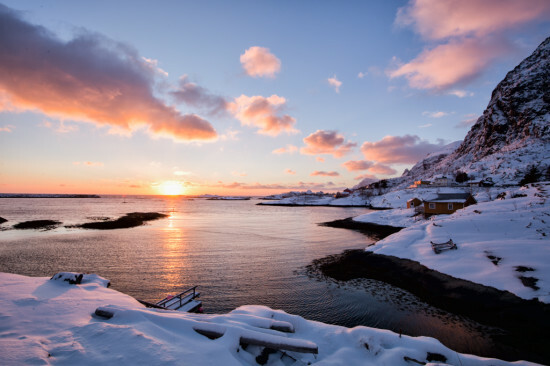 I had not driven in winter conditions before I went there, but I was cautious and watched my speed, and thus was able to successfully drive around the islands for five days. However, you do run the risk of running into winter storms, which I did on my final day there. 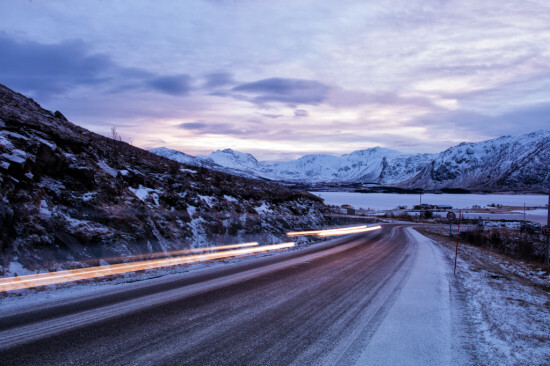 I have written much more in detail about my driving experience at http://www.bootsandabackpack.com/best-ways-drive-norwegian-fjord/. 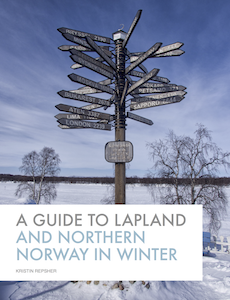 This should give you a number of tips on how to have a successful winter trip there. Great photo!!! We plan to visit lofoten around early January 2018. May we check how Long is the twilight appearing and usually start from what time? And how Long will the reine be totally darkness and from what time? Thanks Low shu juan. Unfortunately I can’t give you exact times as sunrise and sunset vary drastically between the beginning and end of January. 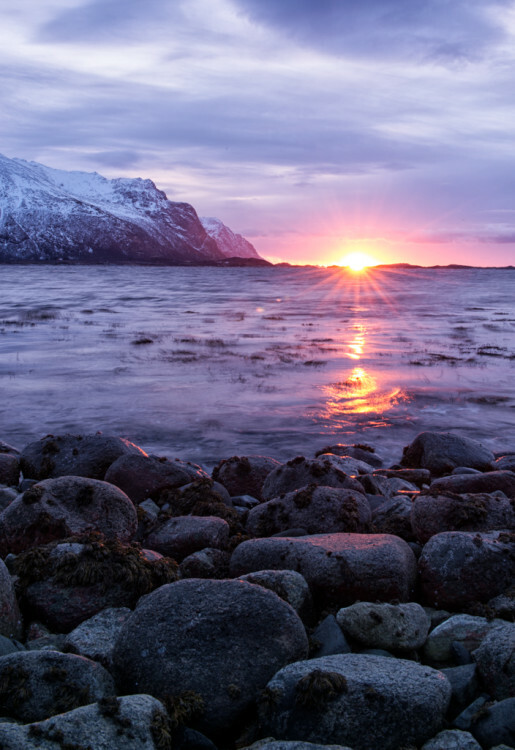 Your best bet is to use a resource like TimeAndDate.com — they have a page for sunrise and sunset times in Leknes at https://www.timeanddate.com/sun/norway/leknes?month=1&year=2018. Amazing pictures and write up! I am going next January and about to buy a new camera. And recommendations for a begginer/intermediate camera to capture similar quality images? 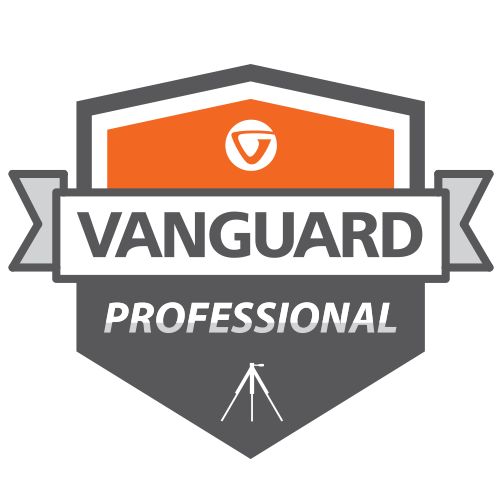 Mirrorless or DSLR? Hi Mac! Great to hear you’re heading to Lofoten — it will be such an amazing trip. As for camera to buy, there are so many different options that it’s hard to know where to start. Either a mirrorless or a dSLR will work well, since you’ll be able to use manual mode to shoot the northern lights at night. I personally like the Nikon D7000 range of cameras because they are flexible and offer a lot of options without being huge; Olympus makes some great mirrorless cameras without the bulk as well. I had an OM-D EM-5 for a while and it was a great piece of gear and made my camera bag weigh about half as much! Happy to chat more about specific requirements if you’re interested — just send me an email (details on my contact page). Hi Kristen, what time of year were you there. 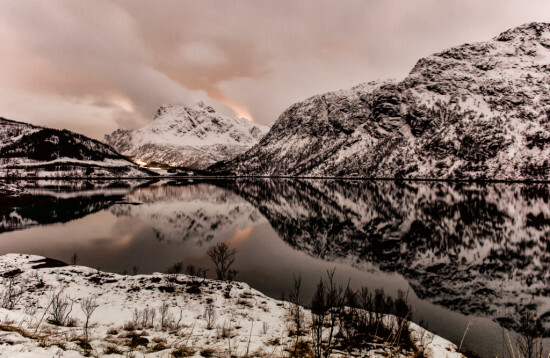 We might be in Tromso and Lofoten around Christmas – New Year, but I was thinking that that may be to dark to do any decent photography?But as you said, Aussie to Norway once in a lifetime – might have to do it! Hi Tony, apologies, but somehow this comment ended up caught by a filter and I only just saw it when doing a site cleanup. Did you decide whether you’ll be heading up to Tromsø and Lofoten? There is not a lot of light at that time of year but it can be quite magical for photos with the extended blue hour and hints of colour as the sun gets close to the horizon. I definitely recommend it! Hi Kristin, Fabulous photos. Thank you for documenting your trip and sharing it with us all. I’m going in January next year and not yet got a hire car. Did you hire a 4×4 or was a standard car enough? Thanks Richard! I did not hire a 4×4 — I just had a full-size automatic (I believe it was a VW of some sort) as there didn’t seem to be any 4×4 options around Evenes or Leknes. 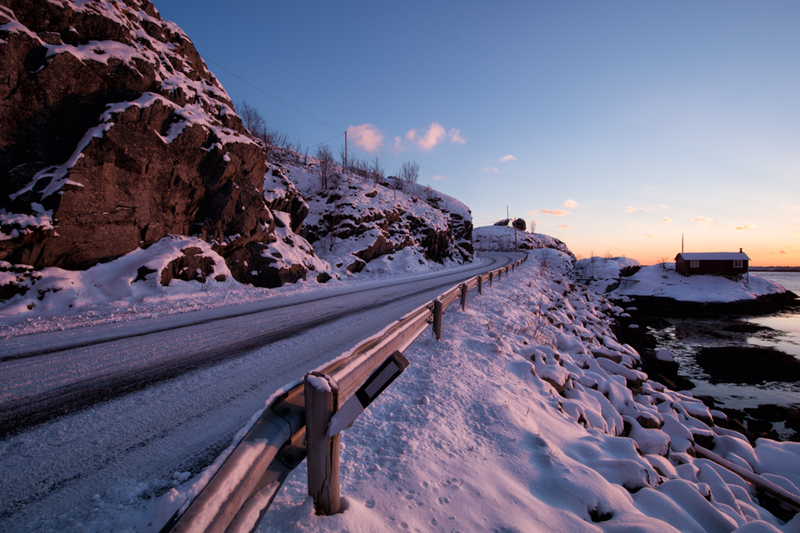 All hire cars in Norway will have studded winter tyres, which will help significantly with traction. I hope you have a great trip and drive safely! Amazing shots and a great write up. 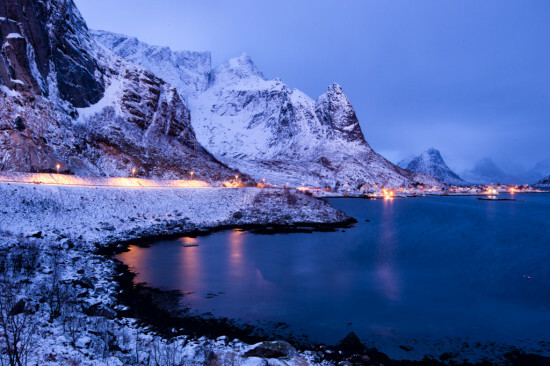 I’m heading to Tromso on 8th Jan and going to drive down to Narvik and to the Lofoten Islands – a 5 day trip in total, weather permitting. Your photos are exactly what I want to capture. Any photographers in the area, get in touch. Thanks Phil! I hope you have a great trip around the Arctic north. Would love to see some of your photos! As soon as I have some I’ll let you know, pouring with rain and very cloudy at the moment! Yuck! Fingers crossed the weather gets better. It can be very fickle along the coast there! 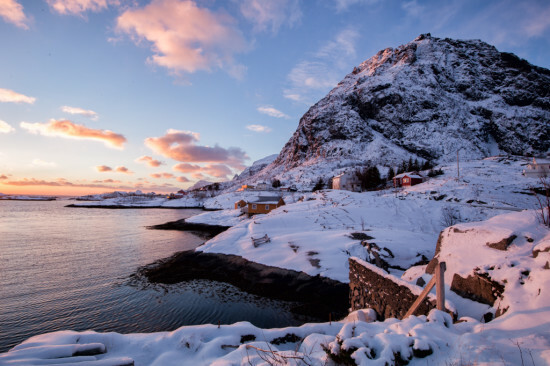 This blog post is pretty much responsible for me ditching the usual Hurtigruten cruise and going it on my own for the two weeks i have in Norway – five days of which will be in Lofoten 🙂 Absolutely amazing and oh so inspiring, thank you!